Founded in 1930, Citizen Watch Company has a reputation for excellence in service, innovation and styling. Their revolutionary light fueled Eco Drive watches never need a battery change. 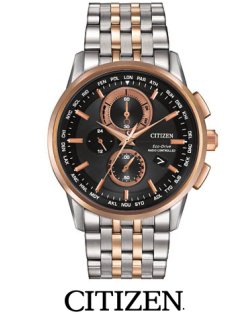 From everyday styles to more elaborate timepieces the Citizen line truly offers a style for everyone. Click the image to see more styles. Jorg Gray has expanded from an American specialty private-label watch company to a worldwide brand. Revered for its fashionable timepieces, Jorg Gray creates modern, yet timeless watches which maintain a respect for traditional principles of precision and attention to detail. The brand's visually striking, boldly designed watches combine styles, materials and colors that appeal to today's discerning customer. Click the image to see more styles. Shop our vintage collection of classic timepieces in store. Featuring both strap and pocket watches from such brands as Hamilton, Elgin, and Tiffany, a vintage watch is the perfect addition to any watch collection.